Thinking about Poverty provides a critical understanding of poverty in the global context: how global structures affect people in Australia and the way policy-makers respond. In the midst of waning public interest, the book fills an important gap in the current public discourse on poverty and covers: the extent of poverty and unprecedented wealth and income inequality across the world, including Australia; why neoliberalism remains at the heart of mainstream global discourse and continues to shape public policy; how a deregulated and speculative global economy creates massive private and public debt, undermining the real economy, employment and wage growth; why neoliberalism still influences national governments to implement further privatisation, deregulation and other neoliberal policies which implement corporate tax cuts, and re-distribution of wealth and income upwards, while at the same time reducing welfare provisions that exacerbate poverty, social disadvantage and inequality; the pivotal role and importance of the welfare state to alleviate some of the excesses of neoliberal capitalism; individualised and structural theories that try to explain the existence of poverty; mainstream and alternative poverty definitions which are not based solely on economic measurements; and the impact of public policy on various groups, including Aboriginal people, the unemployed, the mentally ill, older Australians, people with disabilities, women and families. 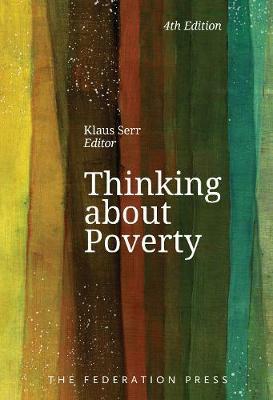 Thinking about Poverty argues that the quality of any society must be judged by its values and norms; that without a just and decent moral code, humanity is unlikely to be able to survive the social, economic and political challenges ahead. Having large numbers living in deprived conditions, while a few live in extraordinary luxury is clearly not just – nor is it morally defensible. The book therefore concludes that political leaders are liable to lose the legitimacy to govern if they continue the current course of governing for a chosen few rather than for the overall common good. Not just a critique, Thinking about Poverty puts forward a range of policy strategies and alternative economic thinking. With contributions from academics and practitioners, the book makes a contemporary and accessible contribution to discourse about poverty in Australia. Contributors: Robert Bland, Andreas Cebulla, Benno Engels, Sue Green, Paul Harris, Ilan Katz, Helen Kimberley, Sonia Martin, Ruth Phillips, Eric Porter, David Rose, Klaus Serr, Karen Soldatic, Ben Spies-Butcher, Frank Stilwell and David Sykes.